Superb house in provence, a great base in order to discover the region and its breathtaking lanscapes. Swimming pool, WiFi, 42Tv, kitchen all equiped....comfort guaranteed. Outside bbq build in, net for badminton/volleyball, hamac suspended between cherry trees...all within 2000m2 of secured land with electric gate. 2 double bedrooms, a third with two single beds or possibility of a study..
Not far from Aix en Provence, in the countryside. Great for a breath of fresh air. A fantastic pied a terre to discover or re-discover the region.. Toilets and bathrooms are separated. Our visit in June 2017. A peaceful and comfortable property with lovely gardens with birdsong all day long. Enjoyed the ping pong and badminton and the barbeque. Pool also enjoyed once you get the hang of the pool alarm. My wife and I and our 2 children would go back. We were a family of five, 2 adults and 3 Children and stayed one week. The house had everything, a large pool, table tennis, hammocks and a very nice living room. It had outdoor kitchen that we did not use. The surrounding was perfect, silent and a big garden, we did not play volleyball since the grass was too high. We found the smaller boulangeries nearby and you need to drive a little further to find larger supermarkets. We are very happy that you have enjoyed your stay. It is always gratifying to hear such positive feedback. In the hope that you had a safe trip back. Merci de nous avoir permis de passer une super semaine avec nos 2 chiens au calme et au soleil. Accueil parfait, piscine top et très belle région. Super Feriendomizil für Familien mit Kindern. wir möchten uns für die schöne Woche in der Villa bedanken. Sehr kurzweilig und interessant. Keine Sekunde Langeweile. Haus war super und der Pool einladend. Die Kinder waren die ganze Zeit drin. Uns hat es an nichts gefehlt. P.S. Die Kirschen waren SUPER. Villa bien agencée et pratique ! La villa est très agréable car bien agencée, facile à vivre, au calme avec beaucoup de points d'ombre et un super piscine. Cependant le mobilier est un peu vétuste . Quelques plats supplémentaires auraient été les bienvenus (saladier, plats pour aller au four..) , dommage aussi qu'il n'y avait que 3 transats au bord de la piscine alors que nous étions 6. Sinon nous avons passé un excellent séjour dans cette maison . J'ai pris note de vos commentaires, et agirai en function. Das Haus ist gut geschnitten und ausgetattet, aber nicht mehr ganz neu. Es hat alles sehr gut funktioniert und wir haben uns wohlgefühlt. Toller Pool (wir haben den etwas nervigen Alarm deaktiviert), wunderbare Terasse mit Sonne sowohl am Morgen als auch am Abend. Im Ort gibt es einen sehr guten Bäcker, eine sehr gute Metzgerei und einen kleinen Supermarkt. Für größere Einkäufe muss man ca. 15-20 Minuten Auto fahren. Auch um abends mal ein Gals Wein zu trinken, muss man 15-20 Minuten nach Les Greoux fahren. Wir haben abends zumeist den Grill angeworfen. Die relativ nahegelegenen Seen (ca. 30 Minuten) sind sehr schön. Ein Highlight ist noch die sehr gute Tischtennsiplatte! Nette und sehr zuverlässige Kontaktperson vor Ort. Glad you liked your stay. 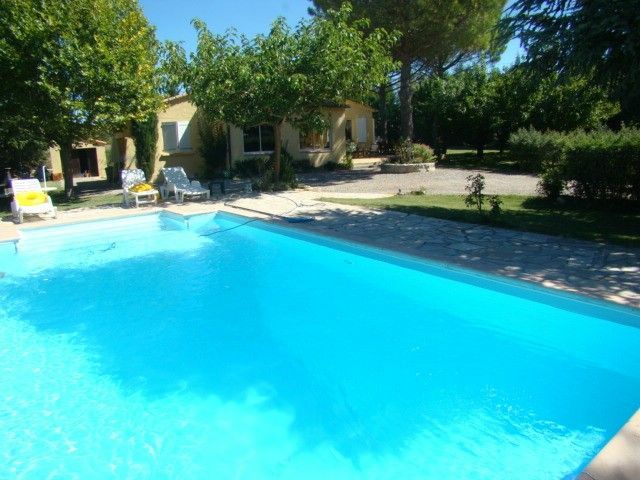 lovely provencale house of 100m2 with swimming pool, 42'tv, wifi,and with 2000m2 of land, including lawn and cherry trees. Private access, electric gate, discretion and calm guaranteed. Horse riding, climbing, Canoe Kayake, gliding, tennis..
Next to to the beautiful natural lake of Esparon, next to the Gorges (Canyon) du Verdon. Local ammunities in the hamlet, butcher, epicerie, bakerie, pizza; Vinon and its supermarket being 10 kms away. 2 double bedrooms, a third bedroom with 2 single beds or possibility of a study.